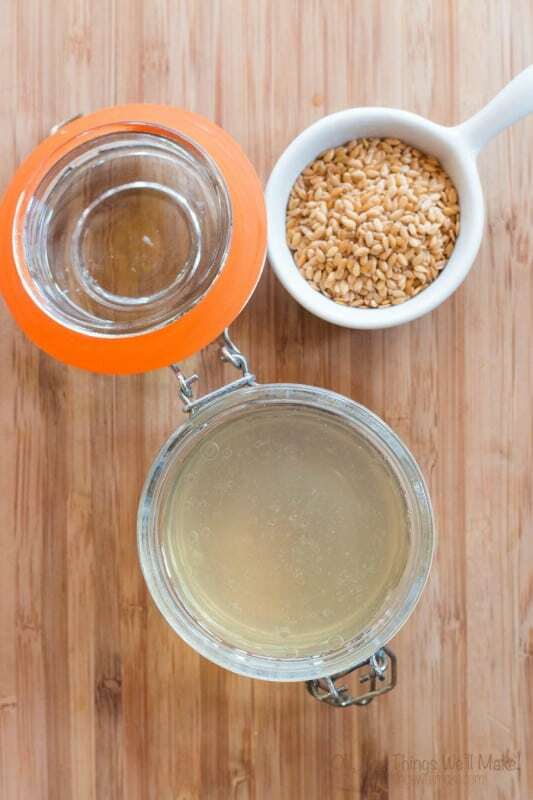 Nourishing DIY Flaxseed Hair Gel - Oh, The Things We'll Make! I have to thank a friend of mine for introducing this DIY flaxseed hair gel to me. We were talking about flax seeds one day, and she commented that in Columbia it wasn't uncommon to make a flaxseed hair gel out of them. I was fascinated, and had to try it out myself. If you've been following my blog for awhile, you've probably noticed that sometimes my hair is perfectly straight, and other times it's relatively curly. In reality, I have unruly, wavy hair that likes being curly in the bottom layers while straight on the top layers; It's pretty frustrating. In the winter, I blow dry my hair to keep myself from getting cold, and that automatically mostly straightens it out, even when I don't try very hard. In the summer, though, I like to stay cool, while giving my hair a break, by letting it air dry. When I let it air dry, though, my hair's true colors start to show, and I have to try to wet and scrunch the top layers of my hair while it's drying to try to even it out and make it look wavy/curly all over. For several months last year, I tried a “no-poo” method of cleaning my hair, and went months only washing my hair with baking soda and water. 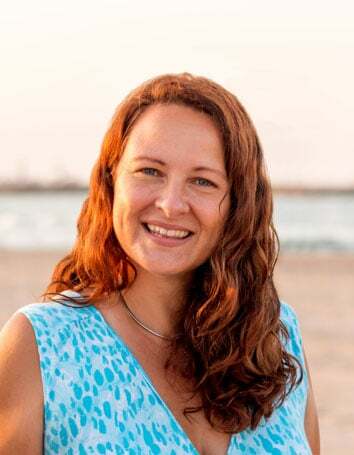 It had been something I had unsuccessfully tried years before, but the nature of the hard water in our region of Spain meant that I always had a buildup in my hair that made washing with only baking soda impossible. Once we installed a water softener, though, I gave it a try again and was hooked from he very beginning. My unruly hair was looking better, and my hair became more evenly curly all over. I think that part of the reason that the top layers tend to be straighter is that the hair there is dryer because it's most exposed to the elements. The no-poo methods clean your hair without stripping them as much, and I didn't need to condition my hair anymore; yet it still was softer and more tangle-free than before. It was also more evenly curly all over. I went back to using small amounts of shampoo and conditioner, albeit less often, but my hair started to feel dryer again, and I started to get dandruff!! Fast forward to just recently. A friend blogger, Krystal from Natural Fit Foodie, introduced me to soap nuts, and I've been experimenting with washing my hair with them. I'll tell you more about soap nuts some other day after I've experimented with them a little more. Meanwhile, I'll say that they've been working pretty well as a “no-poo” alternative. Not long after beginning my new method of washing, I learned about DIY flaxseed hair gel. I decided to whip up a batch and give it a try. I have to admit that I was a bit skeptical. I never really use any products on my hair, other than a bit of argan oil on the tips, because I hate the way they feel. If I have to be honest, the DIY flax seed hair gel doesn't look very appealing either. I was worried that the DIY flaxseed hair gel was going to be sticky and gross, but I was pleasantly surprised. It wasn't sticky at all, and I didn't feel the need to go running to wash my hands off after applying it like I do with pretty much all other hair products! It just feels clean! It is said that a DIY flaxseed hair gel works much better for curly and wavy hair than it does for straight hair. I'm not sure as I have only tried it on my own hair, but I've read that a fenugreek hair gel works better for straighter hair. It's pretty easy to make, and I think it works really well, so let's get to it! Add your water to a small saucepan and boil it. Once boring, add in your flaxseeds and lower the heat. Keep heating over medium heat until the water starts thickening up and getting frothy. If you want to avoid the straining step later on, you can choose to boil your flaxseeds in a tea strainer or drawstring bag. Some people find it easier that way. I've done it both ways, but most of the time just choose to boil them directly in the water and strain later because I feel like they release more gel that way. If you are straining the seeds out of the gel, work quickly or the gel will get thick as it cools, making it hard to strain. Pour the mixture over your strainer and storage jar to remove your flaxseeds from your gel. If it is too thick to strain it, you can always add more water and heat a little more if necessary before trying to strain it again. Either golden or brown flaxseeds will work, but the darker flaxseeds seem to give off more gel than the golden flaxseeds, so you may have to play with the ratio of water and flaxseeds to get the consistency of gel that you prefer. The gel may also be a bit darker when made with the darker colored flaxseeds, but it really depends upon how long you were boiling them in the water. Well, here is a picture of before putting the gel in, and right after putting it in my hair without any further styling. I'm pretty happy with that for quick and effortless summer styling. Of course, I can always go back and define some of the curls better if I'm going out and want my hair to look even better. When you first put the gel on your hair and let it dry, it will get a little bit crunchy. 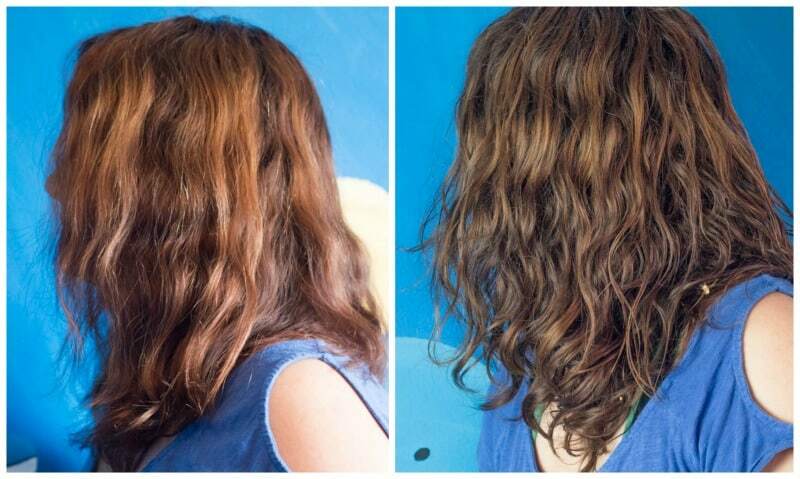 You can scratch your hair to make it soft again, and your curls will stay defined. I find that when I'm using this gel, I don't have to reapply every morning, but instead brush out my hair and slightly wet it again to reactivate the gel. I only reapply after washing my hair. It's really inexpensive and easy to make! I hope you try it and enjoy it! Thanks so much for sharing! Do you know how long this last for? Also can you add a preservatives in it to make it last longer? Without a preservative, you’ll need to keep in in the fridge and use it up within a week. I have used a preservative with it before, and it seemed to be OK. The problem with using a preservative in these sorts of mixes at home is that without testing, it’s impossible to know if bacteria are growing in it. Anything that is on the organic side (food-like) tends to be harder to preserve. We eat roasted ground flaxseed powder to which I add water and apply on hair & face as a mask sometimes. Is flaxseed gel more efficient than just flaxseed powder paste? Does the gel have more nutrients than the flaxseed itself? I’m not sure if it’s more nutritious or not. In this case, we’re really using it to give a hold to our hair and use it as a leave-in styling product. It’s meant to be a more natural alternative to store-bought hair gels. Because it’s meant to be left on the hair as a styling product, you don’t really want the fiber of the flaxseeds in the product or you would see those in your hair. I’m not sure if it will have any added benefit using it right before showering. It’s meant to be more of a styling aid rather than a conditioning type product. Hi… Can colour my hair after applying flax seed gel? I hadn’t heard of it, and just gave it a look. It sounds like what I’ve been doing lately and, yes, it’s been doing wonders for my hair. I’ve been making my own cleansing conditioner type shampoos. My DIY conditioner also works really well on my hair! Did you ever give an update about your experience with soap nuts? I’m curious! Actually, I never got around to it because I was never really sure how well they worked. I will say that I used them for all sorts of things. I used them to wash my clothes, to wash dishes in the dishwasher, to wash my hair, etc. Can I apply flax seed gel before I do straightning. I don’t want to use chemical . I’ve never tried using it before heat straightening because I like to keep my curls, especially since the quality of my hair has improved recently due to not washing it as much and using natural products like this one. That said, I don’t see why it wouldn’t work before straightening. As for the stickiness… You probably didn’t do anything wrong. 🙂 The gel will feel slightly sticky when you hold it in your hands, but once it dries, the stickiness goes away. So, yes, it’s normal for it to feel slightly sticky when you are putting it in your hair, but once it dries it will harden and when you play with your hair, it will crackle and then your hair will then feel soft. I hope that makes sense. It doesn’t leave a stickiness once dry. You have a beautiful blog! I have been making my own flax seed gel for about a year now, and I love it. But I’m curious, do put the gel in while your hair is wet or dry? Thank you! That said, I find it very convenient to use in towel dried hair too, especially before drying my hair with a blow dryer and diffuser. lol i bet they are tasty mine came out kind of thin but it was still pretty gelled it wasnt a solid like i expected was it supposed to be that way? Well, it kind of depends. If you want it thicker, you can either cook it longer, use less water, or try the brown seeds if you were using the golden ones. The muslin bag may also be affecting the amount of gel that gets made. I’ve since stopped using the bags because it was just easier for me to strain them with a stainless steel strainer. I haven’t tried it, but I would suspect that you would be able to reuse them to a certain extent, but that you wouldn’t be able to get as much gel out of them the second time. Yes, you can put them in the fridge and reuse them. I’ve done it before, but didn’t like the gel the second time around. I need to update the recipe with another option: to preserve the gel with a natural preservative like Leucidal. That allows for making a gel that should keep out of the fridge for up to 3 months.